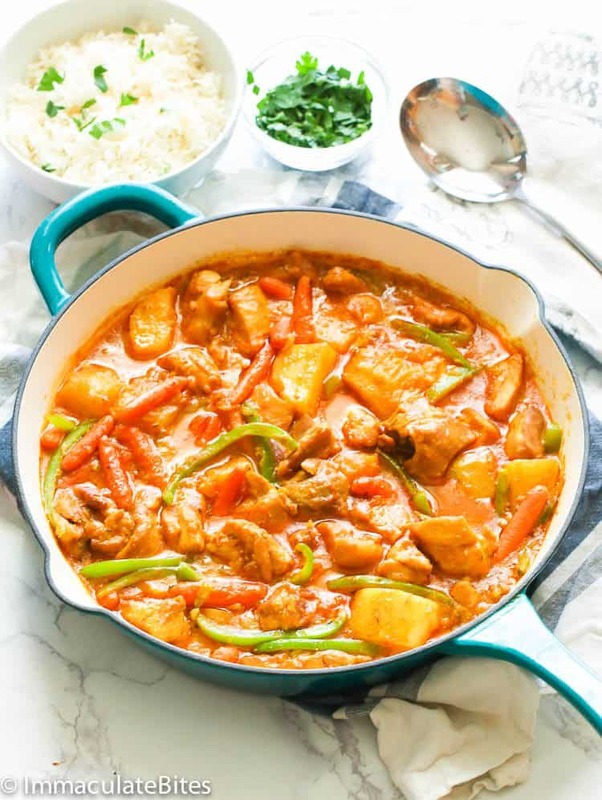 Chicken Curry Recipe – an easy one-pot meal that is bursting with flavor. 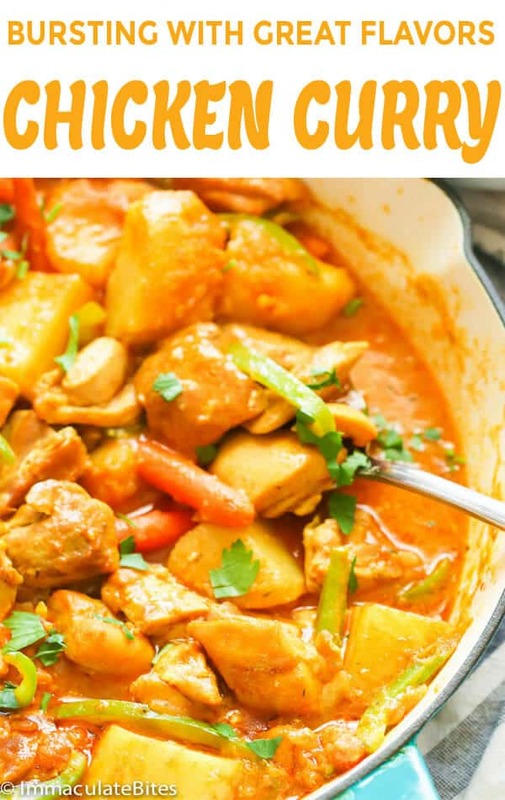 The most delicious curry stew; you will want to make this over and over again. Is it just me, or did you guys know that curry is just not “A” spice but a balanced of mix flavors made by assembling and infusing individual spices. You know, I recently stumbled upon this information and felt just a little bit stupid. No wonder certain brands never appealed to me- some are too spicy others are mild and sweet. So if you are like me, make a selection based on your preference. Are quick, easy, spicy, exotic and creamy attributes that you want for a dinner meal? Don’t sweat it! It is not far fetched. Because this chicken curry will get you everything you want…. well everything you want in a meal, and MORE. There are a lot of variation for this scrumptious dish. But don’t you know that aside from the Indian subcontinent, chicken curry is also widely popular in Southeast Asia and the Caribbean? 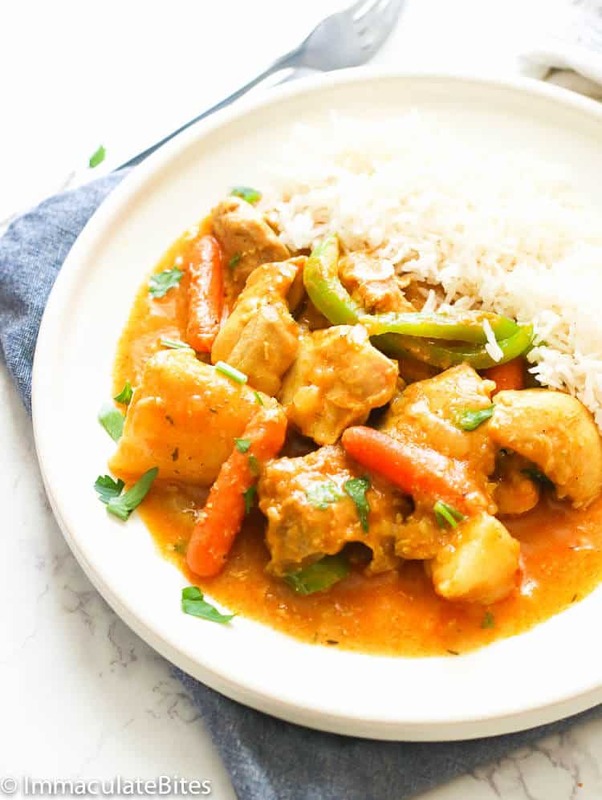 Moreover, Indian curries has more depth using a variety of spices like turmeric, cumin, cinnamon, coriander, cardamom and more in an onion-tomato based chicken stew. On the other hand, notable curries outside South Asia are often prepared with a pre-made spice mixture known as curry powder. What are the ingredients of chicken curry? All thanks to my homemade curry powder, this chicken has never been this easy and oh-so-tasty. You should probably know by now that whenever I can, I love making my own homemade seasonings and spices. Making your own seasoning guarantees that you know what goes into your dish and adjusting it to your preference. Quick, easy, no additives or fillers AND it tastes way better than your store bought brands. I also added half a teaspoon of paprika for more depth and of course, coconut milk for creaminess. Can I use bone-in chicken thighs for chicken curry? What I love about this chicken is that it comes together quickly and you can use whole chicken, legs, and thighs with or without bone. For a really quick meal like this one here, use boneless chicken thighs and you are set. I used about 1 1/2-2 tablespoons of curry powder; feel free to adjust according to taste and blend of curry. This recipe was first published on Oct. 7, 2014 and has been updated with new photos, a video and additional writings. 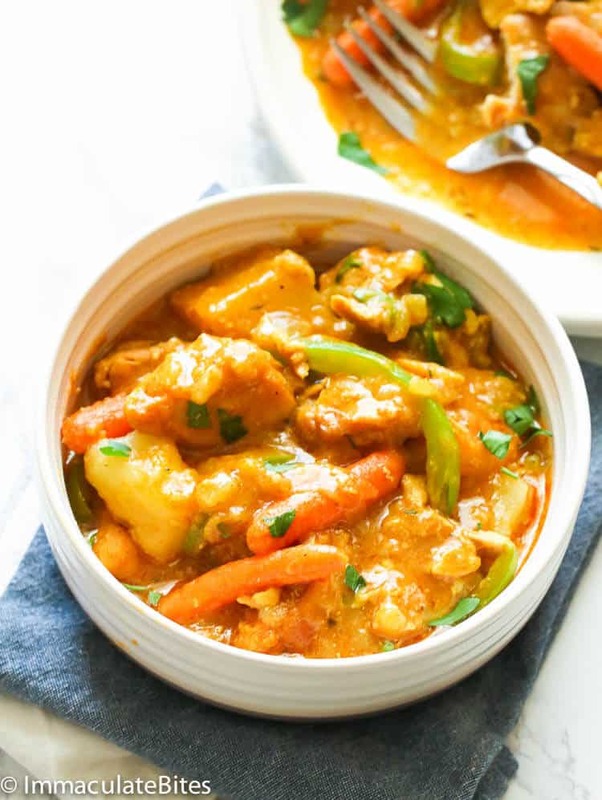 Chicken Curry Recipe - an easy one-pot meal that is bursting with flavor. 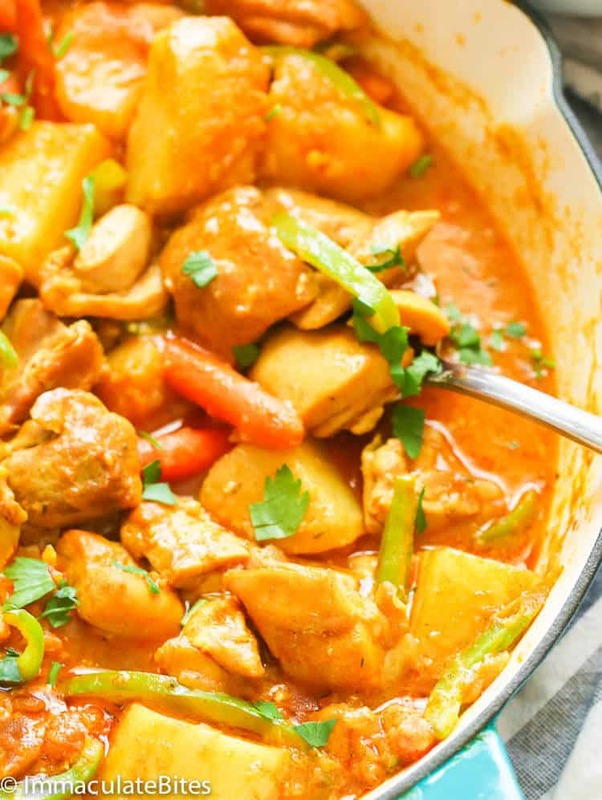 The most delicious curry stew; you will want to make this over and over again. Season chicken with, salt and pepper and set aside. In a large pot, heat oil over medium heat, until hot, and then add the chicken and saute for about 3-5 minutes or until slightly brown. Pour in coconut milk, and tomato paste, continue cooking for another 2 minutes. Then add about 2-3 cups water. Season salt and pepper and cook for about 15 minutes. Gently throw in potatoes, followed by carrots. Cook until potatoes are tender - 7 minutes or more. Add sliced bell pepper. Cook for about 2 minutes. Add chopped parsley. Adjust sauce thickness and seasoning with water or broth, salt according to preference. Season chicken with, salt, pepper and set aside. In a large pot, heat oil over medium heat, until hot, and then add the chicken and saute for about 3-5 minutes or until slightly brown. Add curry powder, onions, followed by minced garlic, thyme, and paprika. Stir for about 5 minutes, for the flavors to blossom. Pour in coconut milk, bay leaf and tomato paste, continue cooking for another 2 minutes. Then add about 2-3 cups water/chicken broth. Season with salt and pepper and cook for 15 minutes. Gently throw in potatoes. Then add carrots. Cook until potatoes are tender – 7 minutes or more. Add sliced bell pepper. Cook for about 2 minutes Add chopped parsley. Adjust sauce thickness and seasoning with water or broth, salt according to preference. Serve warm. Don’t advertise this as Jamaican. 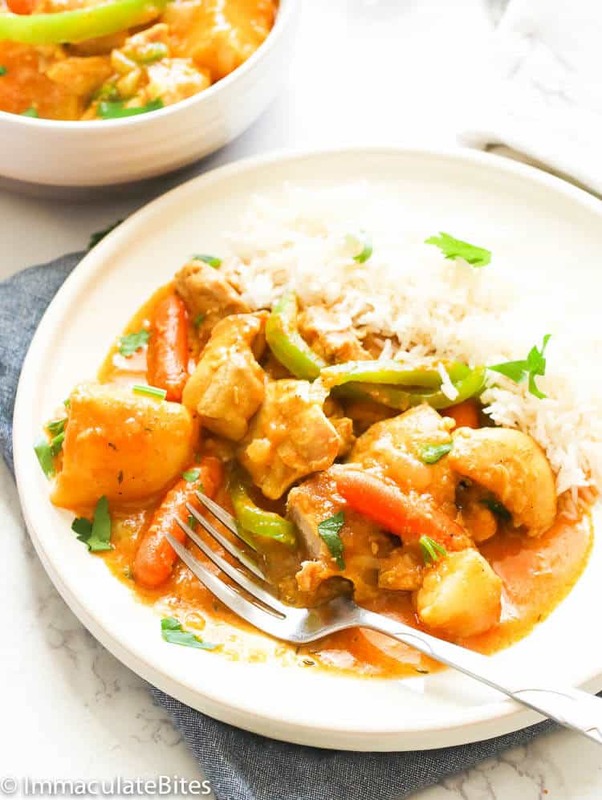 There is nothing Jamaican about the spices, method and end result of this chicken curry. First of all we call it CURRY CHICKEN… nobody sez chicken curry a yaad. Yuh mussi waan smaddy lick yuh inna yuh head back! Yuh mighta get something weh delicious in your own right but doan call it JAMAICAN!! Can i use store bought curry powder ?? You may replace it with almond milk or half and half. Well done once again! I’ve never tried any recipe of yours that was not delicious. I made this recipe exactly as you said including the curry powder and my entire family loved it! 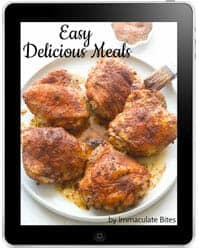 Thanks for sharing your wonderful and delicious recipes. You’re welcome, Tarsha. Glad you and your family love it. Happy New Year! I’m so impressed by your homemade curry powder! It looks amazing!! I have to make this recipe for sure! I’ve made this recipe many times in the past, and it’s always been a crowd pleaser! I came back to make it tonight and noticed (I think?) a slight change: did the recipe used to contain green beans instead of green peppers? I missed the green beans this time around for sure! Yes, it did. Green beans or green pepper works just fine. So happy to hear it worked out well for you. Making this and your Rice and Peas right now! The house smells wonderful and the little tastings were delicious. Looking forward to dinner tonight! Yaaay! I’m so happy it turned out great for you, Lori. It really did! I am going to try more of your recipes. We ate it with your rice and beans! Wohoo! That’s great to hear, Julia! I made this curry chicken yesterday,I followed the recipe but only used more of the coconut milk than what was stated in the recipe,the coconut taste kind of overpowered the sauce but it still came out great .im sure by the time I revisit it today it will taste better. Thanks imma. You’re welcome Tobi. Thanks for dropping by. 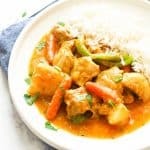 This chicken curry recipe makes a lot of sense and it looks delicious too, I’d love to try it one day. I tried this recipe and it was phenomenal. I added a small Scotch Bonnet for a touch of heat and even the kids didn’t find it spicey. Great recipe.as-is though. It was served over rice which helped to make it a really filling meal. Hi Damon, Love me some scotch bonnet pepper, it always adds another layer of flavor to curry. Thanks for the feedback. My 2-year-old picky eating son couldn’t eat it fast enough this evening! Is the coconut milk sweeten or unsweeten? Made this recipe this evening. Substitited tomato paste with about half a cup of diced tomatoes, and used beef broth instead of chicken (because it’s all I had on hand). I added half a tablespoon of hot sauce and half a tablespoon of jerk chicken sauce for some added kick. Other than that, I followed the recipe and it came out delicious! Total amount of liquid was about 1/2 cup of coconut milk, and 2 cups of low sodium beef broth. It was delicious! However, I let my wife taste it and she said it was a bit salty… She began to add another 1/4 cup of coconut milk and 1/4 cup of water to dilute it a bit and it just completely ruined the meal. It was bland after. So please learn from me and don’t add thin out this curry too much. She then added corn starch to thicken it up and she made it worse. Also! I made the mistake of using chicken beast, but should have stuck to a dark meat, like thighs instead. Highly recommend this and I can’t wait to make it again. Thank you! If it was salty you could have just added more potatoes , so as not to thin out the sauce. Please do I use Irish or sweet potatoes? Hi Jennifer I’m SO thrilled that you all loved this Curry chicken!! I want to try this on Sunday but with chicken wings. Would I need to adjust my cooking times! Yes you sure would . You would have to use your best judgement about 10 minutes less . whilst adding the chicken into the curry sauce and added water it is way too waterly as i only added 2 cups of water into my sauce, what do i do to thicken the sauce as it been cooking for 40mins? Add some cornstarch to thicken it up. Or remove the chicken set aside and let it reduce before adding it back on. Thanks for the recipe it was great! Personally I prefer my potatoes a little crispy so I put them in immediately after taking the chicken out and gave them a bit of a browning in the oil. I then added the garlic and onion as you suggest, but used 50/50 red onion and white onion. I used about 3 cups of coconut milk which made it really creamy and nice (I made quite a lot). Awesome! Thanks for taking the time to share such detailed feedback . Glad to hear it worked out well for you. Just made this for my mother as she wasn’t feeling very well, she loved it as did I. Used chicken breast as had no thighs and added just a little cornflour near the end to thicken, personally I found it much nicer than a lot of other recipes I have used. Thanks for sharing. My Pleasure! Thanks for taking the time to let me know. My husband made this tonight. Delicious! I followed the recipe. As I skipped your pics I did not see anything about scotch bonnet. However, definitely worth trying again. Glad you enjoyed it. I like adding scotch bonnet pepper for some heat and flavor. Hi Imma, how much oil is used to brown the chicken? Thank you. About 2 Tablespoons oil. However, if it’s chicken thighs and are using a cast iron you can even use less. I wanted to thank you for posting a delicious recipe. The house smelled wonderful while the dish cooked. I took a few shortcuts and made some modifications. Because I don’t have much time in the evenings to spend a lot of time preparing dinner for the family, I purchased a rotisserie chicken while getting the vegetables at the grocery store. I deboned the chicken and boiled the skin and bones to make the broth while chopping the veggies. There was a lot of chicken, so I added a large sweet potato, a few more carrots, 2 cans of coconut milk, and 2 more teaspoons of curry. The sweet potato, carrots, and extra coconut milk added a subtle sweetness to the dish that makes it more complex. I added the rotisserie chicken after the veggies cooked most of the way through. We gorged ourselves on the stew with warm crusty french bread. Delicious! OH BOY! You should see me salivating here. Sounds AH-Mazing!!! Thank you for taking the time to share your thoughts with us. I made this last night. It was the best curry chicken I ever made. Simply delicious. AWESOME!!!! Thanks for letting me know. Made this on Monday. I wanted to try your goat curry recipe but changed my mind since I had chicken already. It was absolutely divine! Had it with steamed basmati rice. My guests couldn’t have enough of it. Thank you! My Pleasure!!! Glad to hear it was a hit with everyone. Thanks for taking the time to provide feedback. I tried this recipe last night, of course with some adaptations…but this turned out so delicious! You mention bay leaf but it is not listed in the ingredients. How many bay leaves are you suggesting to add? Do you remove them at the end? 1-2 bay leaves. Yes, you do remove them at the end before serving. Hi Trudy! No worries, questions are always welcome. The Jamaican Curry Mix will work beautifully with this and yes, do pair it with my rice and beans. Banana Cake would good for dessert but not a traditional pudding. Happy Cooking. You inspired me. I wanted to use my leftover roasting chicken but didn’t want a traditional chicken soup. Curry came to mind and I came across your recipe. I decided to add a kaffir lime leaf and a bit of Harissa. Odd combination I know but it worked for my tastebuds. Hi Scott! Definitely a combination am willing to try out. It’s really an interesting one. Thanks for sharing! I see the recipient looks fab but you mention scotch bonnet but it’s not mentioned in the list of ingredients. Please advise how much to use, we love spicy! Yummy yummy! Mmm this dish is delicious but my green beans is not greenish as yours what should I make d green beans in order to maintain d green color? Pls auntie I’m so sorry for d stress. Just that I can’t wait to try this dish but I’m still having problem with parsley leaf no where to get. So pls can I substitute it for curry leaf? Its very urgent cos I’m boiling rice already waiting to cook d sauce. Yes, you can or leave it out completely. Hi Juliet, you can find parsley in major shops in Nigeria like Shoprite or Spar. It’s quite cheap for a big bunch. Bay leaf is sold in the market (dry and in packets) most places where you can cooking spices. Thanks for sharing Onyi. That will definitely help Juliet and others who are looking. And also what kind of vegetable is parsley and bay leaf,I’m in Nigeria now. Parsley ur talking about is it curry leaf and bay leaf is it scent leaf? Thanks Juliet. 3 pounds chicken is about 1.5 kilogram Chicken. Use about 1-1/2 cup of carrots or green beans or both. Hi Ade! Would have love to see the pictures! Appreciate the comment! Hi Diana, thanks for the feedback! I have never tried a Jamaican curry before! How delicious is this..definitely inspired to recreate the recipe, it looks delicious and packed full of yummy flavour! Interested to see that curry powder is the main flavouring in this! Expected there to be a list of 20 spices like so many other curries 🙂 What brand do you use? Nagi, It all depends…. I like purchasing curry at Caribbean Markets- which are usually generic – the spice mix in my opinion is one that is fresher and suits my taste buds. However, they sometimes vary in taste. My advise would be to experiment with several brands and find one that you like- if you like really spicy start with Madras curry powder. Christina, let me know how it works for you! I’m making this really soon, perfect for these cooler nights!